It's the Cosmic Flame. With a fairly short cooldown (2 rounds), if used properly, it lets you remove all buffs from the opposing team every other turn when paired with an AOE weapon/ability like, say, the Dark Sigil or Dr. Strange's Vapors of Valtorr. I wouldn't say it's a must have, but it's very useful in certain combinations. The small regen is just a bonus. 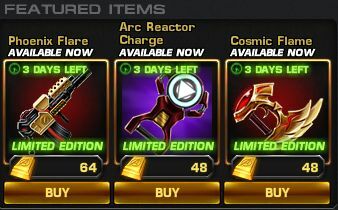 Of course, you still might get it for free as a drop for defeating Red Skull. The Phoenix Flare might look nice for its stealth high damage AOE and small regen, but it also costs you a turn while there are better damage dealing weapons out there. The Arc Reactor is probably the worst of the bunch. You basically sacrifice the next turn for this turn.